vegetables | "A Place for Learning"
One of the best places to get some colorful and interesting reference photos is at Farmer’s Markets. Sunday I rode over to Little Washington with my friend Sandra. We wanted to check out their market and even though it was drizzling rain we found some nice things (bread, baskets, and tea) as well as got a few nice shots for future paintings. 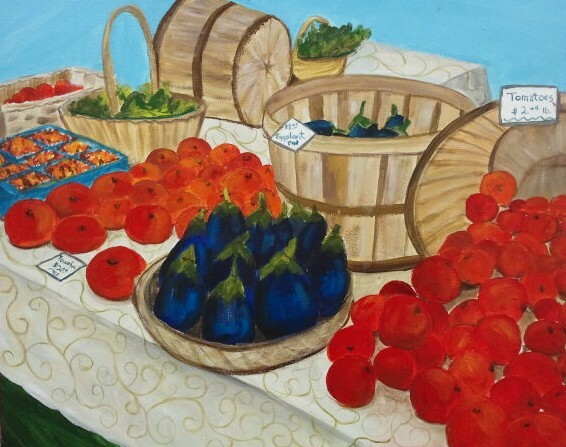 Farmer’s Market, acrylic on canvas, 16″x20″, available for $275. 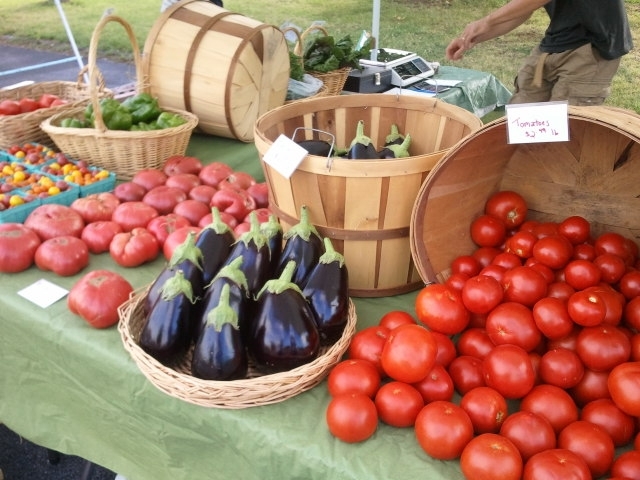 I took several photos at the Farmer’s Market this summer and love how the photos looked so decided to paint this one. While I don’t have a new Farm Animal finished for today’s post I do have food that a little farm animal might eat….lettuce! 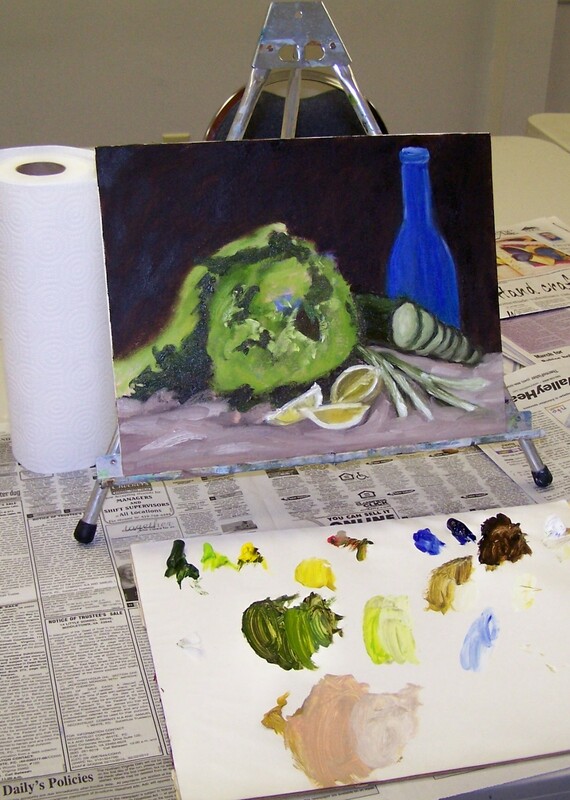 This is the beginning of a lesson we did in art class a few weeks ago. It took a couple of weeks of lessons for me to complete this one because I often start a piece and help others get their painting started and don’t get back to mine. I did finish it in between other projects though and here is the way it turned out. The “Dog Days” of Summer sale is continuing. Today’s theme is fruit and veggies. “Cherry” is an oil on canvas measuring 5″x7″ framed and is on sale for $45. “Large Pear” is an acrylic on paper and is matted (16″ x 20″) and is available for $50 on sale. 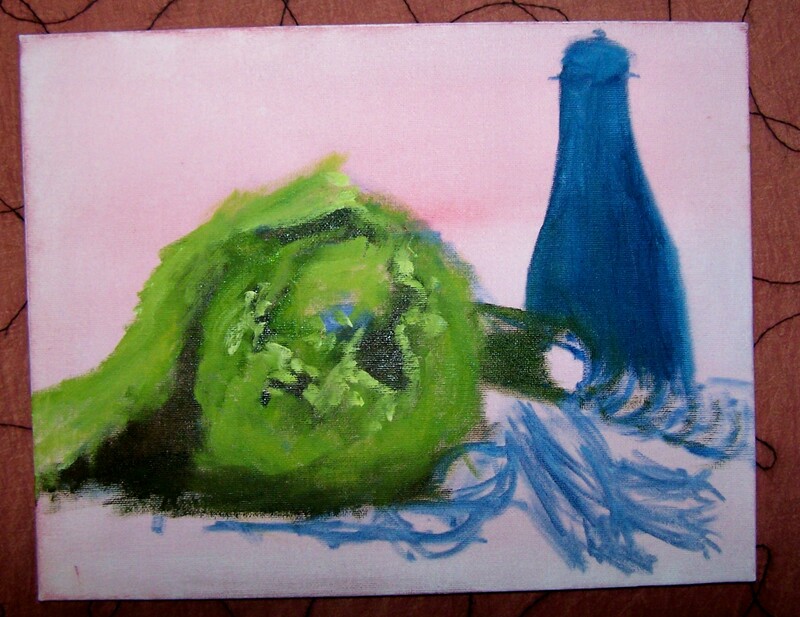 “Two Eggplants” is an oil measuring 8″ x10″ unframed and is on sale for $65. “Radish” is an oil on 8″x8″ canvas and is on sale for $45. “Trio of Olives I” is an oil on canvas measuring 8″x10″ unframed and is on sale for $65. “Trio of Olives II” is an oil on canvas measuring 8″ x 10″ unframed and is on sale for $65. For any of these terrific deals contact kwalker@doubledogdesigns.com . And come back tomorrow for more of the Dog Days of Summer Sale. 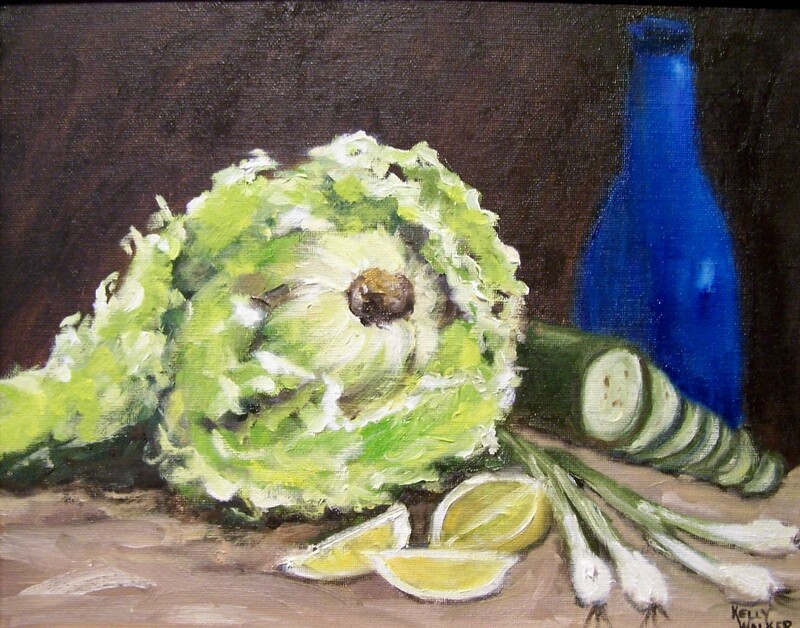 Green Onions I is an oil on canvas panel measuring 8″x10″ and is framed and available for $195. This painting can be seen at Delilah’s on Main Street in Front Royal, Virginia. Green Onions II is an oil on canvas panel measuring 8″x10″ and is available framed for $195. It also can be seen at Delilah’s. A friend of mine plants the most beautiful vegetable garden every year down by the river. And his generosity is enjoyed by so many of his friends. Often in the summer I will find a bucket of delicious veggies on my front stoop. Today it was yellow crookneck squash (Joe knows this is my favorite) and cucumbers. What a treat! I stewed them up with some fresh green onions that I got at the farmer’s market and a little butter, salt, and pepper. Now summer has arrived! Thanks Joe.